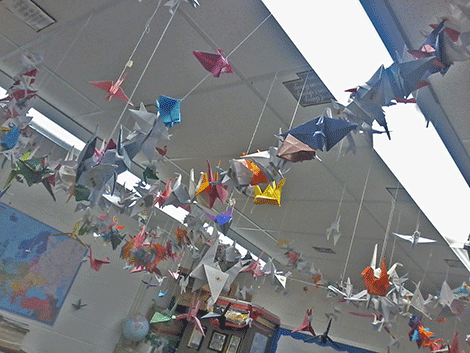 Above are some of the 1,000 paper cranes made at Hermon-DeKalb school that will be displayed in Japan. Photo submitted by Veronica Daniels, an H-D social studies teacher. DEKALB -- One thousand paper origami cranes made by Hermon-DeKalb middle schoolers will be displayed for a year at the Childrens' Peace Monument in Hiroshima, Japan. Seventh- and eighth-grade H-D students made them as a project for a lesson on World War II. They are a tribute to adako Sasaki, a Japanese girl who died from radiation poisoning as a result of atomic bombs the United States dropped on her country in 1945. She was 12 years old when she died in 1952. Other students got involved in the WWII lesson as well. Madisyn Wright presented her grandfather's artifacts from the war.